This past month has been a stressful medical marathon. Four weeks ago I had my old central line pulled due to an infection. Unfortunately, the new line that was placed was not done so properly so three weeks later it was falling out and I underwent yet another line placement. Add in a whole whack of appointments, ER visits, new medications, unwanted side effects and the usual relentless symptoms day and night, and life has been really wearing on me lately. I think you know by now that I like to put a positive spin on things. I do my best to have a good sense of humour about everything…and by everything I mean all of the random, weird, gross, random, frustrating and random stuff that comes along with having a chronic illness. Much of the time this sense of humour is not for anyone else’s benefit, but for my own. I laugh things off because if I didn’t I would probably drown. The weight of it all is too much to carry day in and day out and I keep things light so that I can keep my head above water. In reality, though, there are days when I do carry it all. There are days when it all becomes too heavy and too real. After my line was pulled because of an infection, it never healed properly. Multiple antibiotics later, it was still looking really angry and becoming more and more painful. I was getting really concerned and was ready to call my doctor this morning, when last night I was poking around in the wound and I saw something strange. It was the cuff. It was a piece of my infected line that had been removed four weeks before. Apparently cuffs are occasionally retained when lines are removed and apparently they often don’t cause any problems. I don’t know what the protocol is when the site is infected, and I don’t know if they’re supposed to inform the patient about any of this…what I do know is that for four weeks I had no idea the cuff was still in there and that it was the reason my infection was getting worse and not better. It takes a lot to rattle me. I have tubes pulled out of and shoved in to me without any sedation on a fairly regular basis, and I deal with these tubes at home every single day. But pulling out that cuff? That definitely caught me off guard! To be perfectly honest, it scared me. Most of the time I don’t really dwell on the fact that I have this scary thing in my chest. I don’t focus on the risks associated with it, the extra hassle it adds to my life, and how as much control as I’d like to have, ultimately I have to trust someone else to place it and remove it. I hate that I have not just one, but two tubes in my body that, as the result of an unlucky tug or less than vigilant care, could land me in the emergency room with no notice. I hate that, but that’s overwhelming, so most of the time I just don’t let my head go there. Sometimes, though, I can’t help it. Sometimes the unpredictability, uncertainty and maintenance piles up and becomes too much. Last night it was too much. So I took one. Sort of. There is no such thing as a break from chronic illness. When the problem is family, work, school, whatever, you can escape for a while, but when the problem is your body there is no getting away from that. Instead, you have to settle for a sort-of break. For my sort-of break, I took the night off from TPN. There were still tubes coming out of me, of course, but for the rest of the evening I was able to move around without hauling an eleven pound backpack along with me and I was able to sleep untethered. It was a good start, but when I woke up this morning I was still in need of cheering up. Too sick and tired to go anywhere or do much of anything, I went to my default happy place: Christmas. 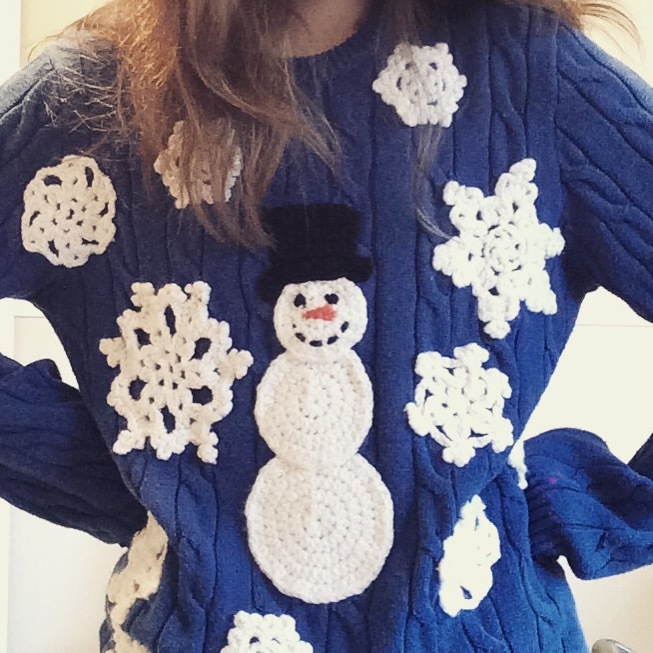 Out came the snowman sweater…my crochet-embellished-tacky-Christmas sweater. I’ve been wearing it all day! And yes, it is making me happy. I know that I’ll bounce back because I always do. I know that soon enough, whether it be a day from now or a week from now, I’ll be able to laugh again at the random, weird, gross, random, frustrating and random things that happen. Everything overwhelming me right now will go back to just being my norm. In the meantime? I’m just waiting it out in my tacky sweater. Most of this post was written on Tuesday and now that it’s Thursday, I can tell you that I am bouncing back. The weight of it all doesn’t seem quite as heavy for now and I’m able to find things funny again. I considered not even posting this now that I’m feeling less overwhelmed, but the thing is, all of that exhaustion, fear and distress are every bit as real and present in my life as the silliness, the humour and the acceptance, and I think it’s important to share that. I also know without a doubt that I am not the only one feeling overwhelmed by life right now, so I just want you to know that you’re not alone in that. I want you to know that it’s okay to need a break and it’s okay to take one. I also want you to know that it’s okay to wear a snowman sweater when it’s still summer. Now, I can’t imagine why you wouldn’t have your own snowman sweater, but just in case you don’t, here’s some winter whimsy to tide you over until you get your own! I’m sorry you’ve had a particularly rough time lately. Even the most optimistic of us go through periods of frustration and discouragement. My husband is chronically ill and it is a constant battle to stay hopeful and positive! I liked your idea of “taking a break” from your illness for a little while. I just subscribed to your blog a few weeks ago, but I have found your stories and thoughts to be so uplifting. You are a fantastic writer! Hang in there! Thank you so much, Christy! I’m sorry to hear about your husband’s struggle – it is a constant battle, for him and for you. I hope you guys can find fun (and low spoon!) ways to take little breaks from that battle! I am sorry you understand these experiences and these feelings, but at the same time (and I feel selfish saying this), I am glad I’m not alone. I’ve been in kind of a dark place lately due to my own chronic illnesses but reading this I think has helped me to find the courage to try and get out of it. Thank you so much. Oh I completely understand what you mean!! I always find myself replying to people and saying that I’m glad my words resonated with them but I’m also so sorry they are in a situation where that’s true. But yes, it is so nice to know we’re not alone. I hope that your dark place has a little bit more light peeking into it these days! This post is overwhelming. And I thank you genuinely for the courage to be that open and vulnerable. You are right…we all have places in our lives that overwhelm us. The fact that you can overcome and pull on your Christmas sweater..well..I just think you are amazing. And an inspiration. Many blessing to you. Thanks! We just have to find ways to get through it, hey? Blessings back to you. Mary’s Boy Child is one of my absolute top favs for xmas. Along with John Lennon’s And so this is Christmas. So glad you shared this Catherine. It takes courage in addition to humor to keep facing the day-in-and-day-out life that comes with having a chronic illness and all the random stuff that randomly comes with it, as you so well described it. Your continued persevering is really supporting your body and health as you find those little random tidbits like port cuffs!!! Here’s to that particular element healing quickly now! Ok Catherine. A Christmas sweater calls for Christmas music. Yes. In September. I mean the best cheesiest, most hokey-dokey variety of Christmas music. Think John Denver and the Muppets Christmas album. Or Raffi’s Christmas album. Or better yet Boney-M’s Christmas album. Here’s hoping that since you’ve found the source of your most current and pressing discomfort, that the infection clears soon and you can bop along to Mary’s Boy Child (because isn’t that everyone’s favourite dorky Christmas Calypso song?!) with a smile soon. Sending you prayers as always for a more comfortable tomorrow! I can see why the sweater makes you happy, it is very tacky! You deserve to smile and be happy. Merry Christmas in September, you deserve it!